The Philadelphia Flyers announced today that they have signed 6’1”, 205-pound forward Rob Bellamy, 6’0”, 190-pound forward Matt Clackson and goaltender Michael-Lee Teslak to entry-level contracts, according to General Manager Paul Holmgren. All three players will report to the Flyers’ American Hockey League affiliate, the Philadelphia Phantoms. Bellamy, 22, recorded five goals and 13 assists for 18 points and 61 penalty minutes in 33 games for the University of Maine Black Bears this past season. An assistant captain for the Black Bears during the 2007-08 season, Bellamy finished first on the team in assists (13) and penalty minutes (61) and third on the team in points (18). In four seasons for Maine (2004-05 through 2007-08), Bellamy registered 15 goals and 33 assists for 48 points and 254 penalty minutes in 137 games. 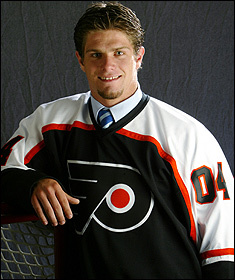 A native of Westfield, Massachusetts, Bellamy was selected by the Flyers in the third round (92nd overall) of the 2004 NHL Entry Draft. Clackson, 22, recorded three goals and three assists for six points and 87 penalty minutes in 35 games for the Western Michigan University Broncos this past season. He was second on the team in penalty minutes with 87. In three seasons with the Broncos (2005-06 through 2007-08), Clackson posted 16 points (4G,12A) and 219 penalty minutes in 105 games. A native of Pittsburgh, Pennsylvania, Clackson was selected by the Flyers in the seventh round (215th overall) of the 2005 NHL Entry Draft. Teslak, 22, appeared in 25 games for the Michigan Tech University Huskies this past season, posting an 8-11-4 record, 2.20 goals-against average, .918 save percentage and one shutout. In 73 career games over three seasons with the Huskies (2005-06 through 2007-08), Teslak compiled a 26-33-11 record, 2.66 GAA and .910 save percentage. He ranks third on Michigan Tech’s All-Time List in goals-against average and save percentage. During the 2006-07 season, he led the Western Collegiate Hockey Association in goals-against average (2.00 GAA - third in the NCAA). He was named to the All-WCHA Third Team following the 2006-07 season.